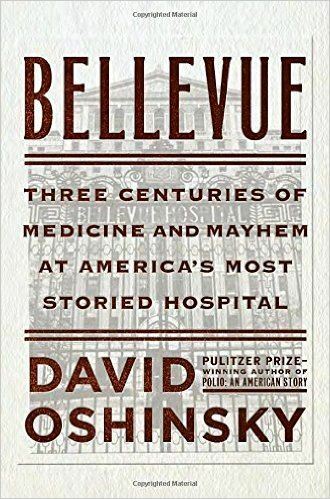 Pulitzer Prize-winning historian David Oshinsky brings us Bellevue: Three Centuries of Medicine and Mayhem at America’s Most Storied Hospital, a definitive history exploring three centuries at America’s oldest public hospital, told through the illuminating lens of public health, immigration, disease, cultural change, and scientific innovation in the world’s most diverse city. Over three centuries, Oshinsky charts the rise of American medicine from butchery and quackery to a professional and scientific endeavor, alongside the rise of New York to the nation’s preeminent city. It’s a story of medical conflict and social progress that begins in the 1700s when Bellevue was an almshouse for the homeless poor and a pest house for the hopeless sick, when elite doctors believed that toxic clouds spread disease. Progress came late to Bellevue — much later than to Europe, but by 1860 the hospital had become the most important medical training ground in America. It treated thousands of Union soldiers, was the first to employ an ambulance corps, and the first to open a nursing school for women. Bellevue men cared for three American presidents in distress — Lincoln and Garfield, who suffered and died, and Grover Cleveland, for whom the era of germ theory arrived in time. In the next century, Bellevue men would tame tuberculosis, yellow fever, and polio in turn. With full access to Bellevue and its archives — and especially to its collection of truly bizarre medical photography, Oshinsky stunningly documents Bellevue’s place as America’s quintessential public hospital. DAVID OSHINSKY, Ph.D., is a professor in the NYU Department of History and director of the Division of Medical Humanities at the NYU School of Medicine. In 2005, he won the Pulitzer Prize in History for Polio: An American Story. His other books include the D.B. Hardeman Prize-winning A Conspiracy So Immense: The World of Joe McCarthy, and the Robert Kennedy Prize-winning Worse Than Slavery: Parchman Farm and the Ordeal of Jim Crow Justice. His articles and reviews appear regularly in The New York Times and The Wall Street Journal. DEADLINE FOR REGISTRATION: Friday, January 20, 2017.